System Performance - The LG G7 Review: A Rushed Attempt? System performance of the G7 is also something that shouldn’t have too many surprises as we expect the phone to behave very similar to existing Snapdragon 845 devices out there – that’s to say, it should be excellent. 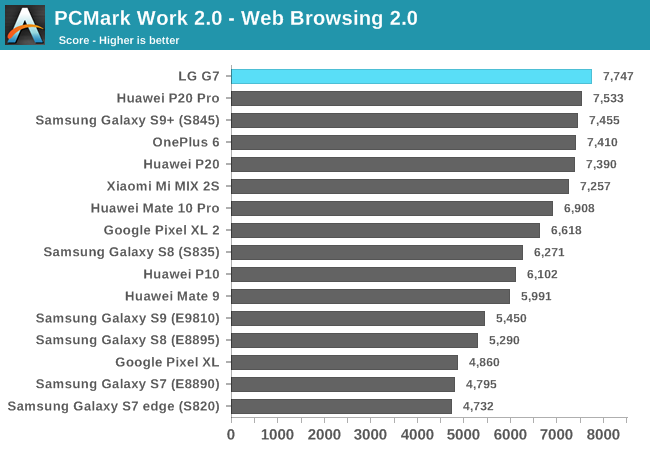 Starting off with PCMark, the G7 fares very well in the web browsing test scoring just a tad more than existing S845 devices. Fluctuations here can vary depending on minute scheduler/DVFS settings down to actual hardware changes such as possible DRAM timing differences. 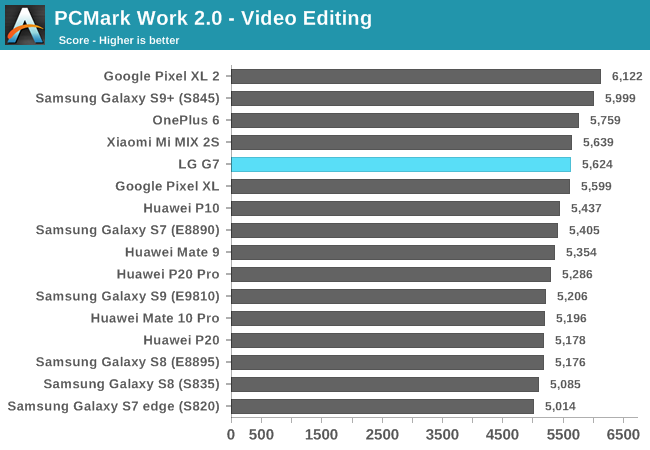 The video editing score ends up the same as the Mi MIX 2S. 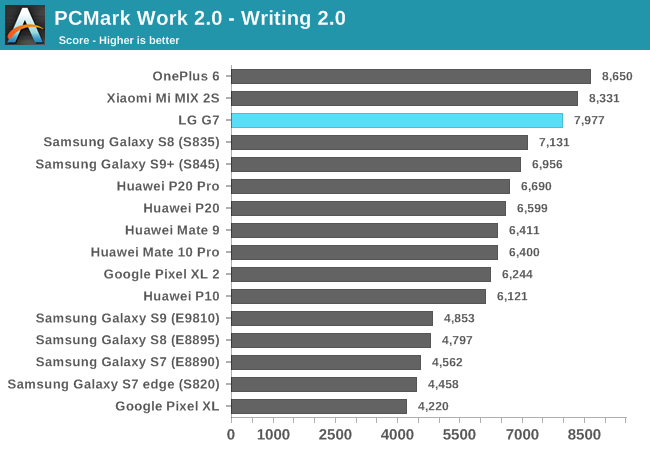 In the writing test which is likely the most important part of the PCMark suite we see that the G7 fares a bit worse than the OnePlus 6 and MIX 2S, however it still has a considerable lead over the Galaxy S9+. 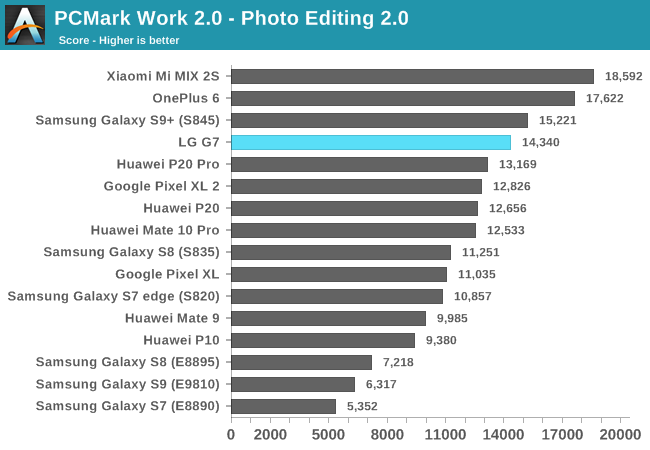 The Photo Editing test we see the G7 as the lowest performing Snapdragon 845 device. 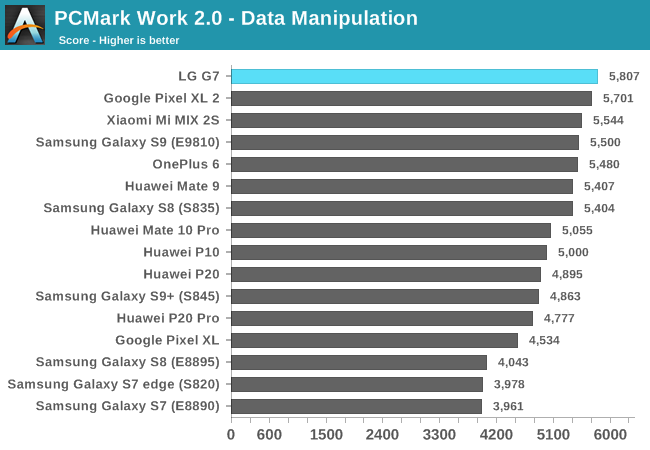 Data Manipulation score is high for the G7, outscoring most other devices. This along with the performance lead in the web test could point out to slight memory latency advantages for the G7. 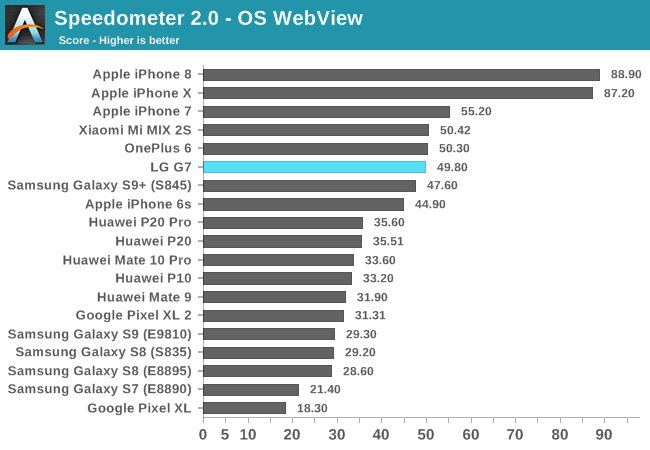 Overall the LG G7’s performance in PCMark is only outshadowed by the OnePlus 6 and MIX 2S. 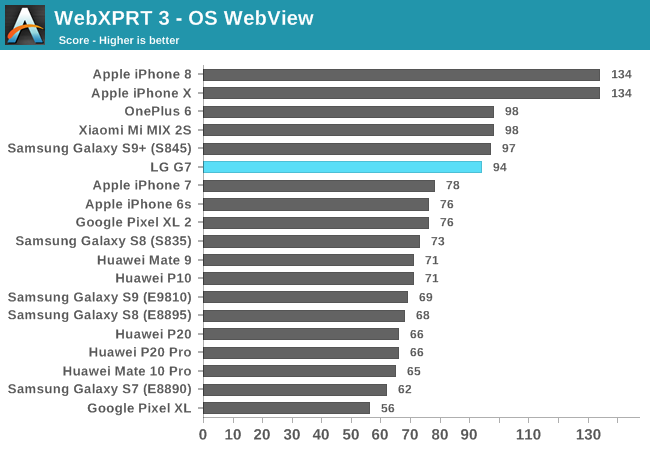 Moving onto the browser web tests performed under a WebView shell, the G7 performs slightly worse in WebXPRT 3. 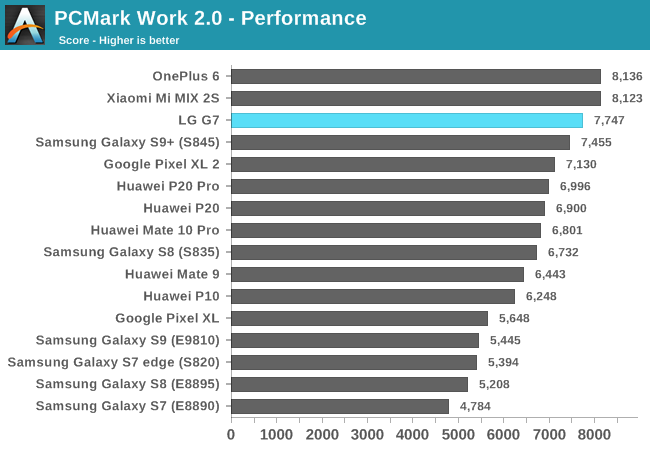 Overall the performance of the G7 was excellent and would satisfy the vast majority of users. I have to add that in terms of feel and experience, I do think that the G7 was among the worst of the Snapdragon 845 devices. There was a notable little delay when switching between Android activities and in general opening applications wasn’t quite as fast as on the OP6 or MIX2S. Looking at the kernel source code it looks like the G7 is running an older branch for the S845 scheduler and it’s more similar to what Samsung was using on the Galaxy S9 as there’s some newer features missing on both devices that are present on the OnePlus and Xiaomi phones.